Scientists have released the first footage of a baby “dumbo”—and it’s no elephant. This is an elusive deep sea creature whose name hails from the Disney character we all know and love for its ear-like fins that help its tiny body travel along the ocean floor. As it turns out, these little fins appear even immediately after hatching. 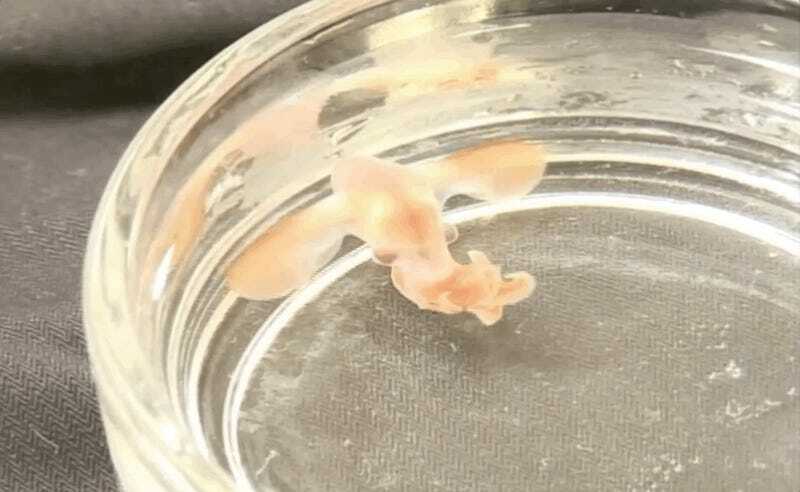 That’s what alerted researchers, who published their findings in Current Biology Monday, that a hatchling they found off the coast of New England in 2005 was, in fact, a dumbo octopus (genus Grimpoteuthis). What’s remarkable about this critter—which lives at depths of 9,800 to 13,000 feet—is that it popped out of its egg pretty much able to do all that it can do as an adult. The hatchling was fully formed, internal organs and all. This told the researchers the cute octopuses enter their environment with the ability to swim, sense what’s around them both chemically and visually, and even capture prey. “I was impressed by the complexity of the central nervous system and the relative size of fins and the internal shell,” said study co-author Alexander Ziegler from Rheinische Friedrich-Wilhelms-Universität Bonn in Germany, in a press release. And this was a dumbo octopus that likely hatched prematurely due to the stress of being collected. Imagine the possibilities if it had been born later. Co-author Tim Shank of the Woods Hole Oceanographic Institution found the chocolate brown egg attached to a coral branch collected by an ROV. After bringing it to the surface, he placed it into a five-gallon bucket, where it began to hatch before Shank moved it to the lab. Since the predator roams the deep sea, dumbo octopuses are pretty safe from human impacts, for now. However, scientists have learned that noise pollution harms octopuses and squids, in general, and the deep sea is not all that quiet—and humans are, in part, to blame.